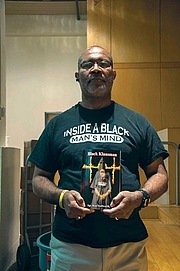 Ron Stallworth (born June 18, 1953) is an American retired police officer who infiltrated the ranks of the Ku Klux Klan in Colorado Springs, Colorado in the late 1970s. He was the first African-American police officer and detective in the Colorado Springs Police Department. Ron Stallworth is currently considered a "single author." If one or more works are by a distinct, homonymous authors, go ahead and split the author. Ron Stallworth is composed of 4 names. You can examine and separate out names.